It’s a big night of league football all over Europe, with key games in England, Spain and Italy. None is more decisive than the game that just finished between Borussia Dortmund and Bayern Munich – the winner was almost certainly going to be crowned Bundesliga champion in a few weeks. Bars and “kneipes” all over Hamburg were packed from before kick-off, with plenty of bars putting screens outside to cater to the big crowds. We don’t have Sky Sports at home, but I knew we had some sports channels, so I flicked through to find Sport 1, which was showing half-time ads. Excellent, I thought, can catch the second half in the comfort of my own living room. The ads finished. 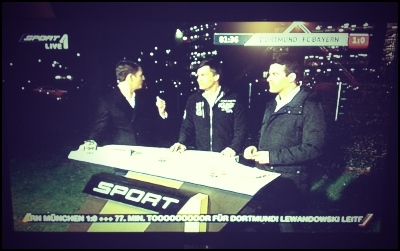 There were three guys standing outside the Dortmund stadium, talking about the game. Kind of weird to be outside the stadium, I thought, but maybe it’s the done thing. Then the second-half started, as indicated by a clock in the top right corner. And the guys kept talking. This is odd, I thought. And they kept talking. The “Live” in the top left corner of the screen referred to the live conversation the men were having about the game going on in the stadium behind them, rather than any actual live coverage of the game. This is really odd. The ticker along the bottom alerted me to the fact that Dortmund had scored a match-winning TOOOOOOOOOOOR in the 77th minute. I guess the guys were talking about it, too, but they didn’t look that excited. I know Sky Sports have their Saturday show where the likes of Matt Le Tissier discuss the games as they unfold, but those matches can’t be screened. This would be like Sky Sports setting up their cameras outside the stadium of a game that was being shown by ESPN, and devoting a few hours to discussing the game, that they weren’t showing. The last time I saw anything like this was in Argentina, where there was extended coverage of matches showing only live footage of the crowd watching the match, with extremely animated commentary of the game, I assume, though perhaps it was a radio drama, or a political debate. That was quirky, but I reckon this is quite a bit worse, kind of like an entire sports station stalking another sports station.